I started to dig a little further into why these ‘proven’ ways have failed and I discovered that some experts believe that these strategies are ineffective or even counter productive. As highlighted by Melanie Thernstrom in her article on ‘Teaching Young Children about Nutrition’ teaching children that a particular food like candy is bad actually teaches them that parents are trying to withhold the candy and therefore it must be highly desirable. 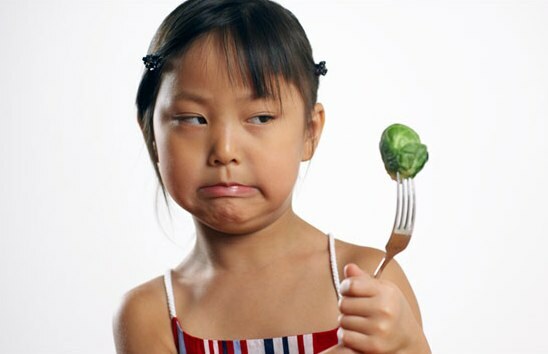 Similarly giving rewards for eating vegetables teaches children that certain foods are so unappetizing that rewards need to be given out for eating the food. Another interesting experiment showed that if kids are shown 2 drinks which are exactly the same but one is labelled as ‘bad’ and the other as ‘good’, once they have tasted both they conclude that the ‘bad’ one tastes better. No wonder I have failed. food categories – showing how there are few food categories but there are many food category members which may look different but they share similar nutrients for example eggs, soy, chicken and fish all look different but all are excellent sources of protein. It was these books that gave the children an understanding for why vegetables are ‘good’ and why they need to be eaten. At no point were the children told that vegetables are ‘good’ or told to eat more of them, yet they proceeded to choose to eat them at snack time. When asked why they are choosing more vegetables the children responded that they need to eat different foods to get different nutrients into the body. Although the children who were part of the experiment ate more vegetables at snack time the results need to be treated with caution because eating vegetables at snack time in the nursery school may not necessarily translate to choosing to eat more vegetables at home. What I really love about this particular approach is that it changes the role of the parent from one of policing to one of empowering. As parents we spend so much time setting rules and enforcing them and it is studies like these that show that we need to focus on giving our children the tools and empower them to make the decision for themselves. Once children understand why they need to eat vegetables it is easier to get them to eat them. Off course as parents we will continue to label sodas, chocolate, candy, cakes, fast food as bad and children will continue to defy us in a bid to establish their own identity and will refuse to eat the foods we tell them are good and choose the foods that are bad just to annoy us. However I do believe that once they really understand the how the body works and why they need to eat various foods, they will hopefully choose the unhealthy foods less often and what they learn as little children will stay with them as they grow. I am excited. Are you? Like like Like! What a great post. I wrote a book for kids, where I told six adventure stories where food was part of the plot. Then I gave a recipe for the food that appeared in the story, so kids and their families could cook it up. I followed up with nutrition basics, a different subject in each chapter. The idea was to lead kids into nutrition concepts through fun (reading and cooking together). I covered many of these concepts you’ve touched on, but in a fun kind of way. I’d be curious what you’d think… maybe you would check me out?